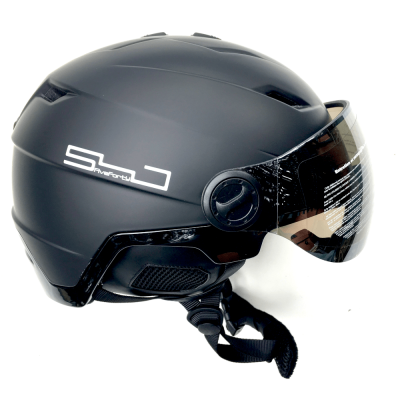 The Snowjam Poseidon Ski Helmet Shiny Black with built-in Goggles is a half shell freestyle design meant to take some hard knocks and come back strong. The Snowjam Poseidon Ski Helmet Shiny Black with built-in Goggles is a half shell freestyle design meant to take some hard knocks and come back strong. Built to absorb shock, similar to most other more expensive helmets on the market with some cool additional features. A removable separate liner pops out for washing. You can also remove the liner and use your beanie inside as well. Padded chin strap adjusts for the perfect fit. Ear pads allow ventilation allowing you to also hear outside noises for safety. These are also removable for Spring conditions. Snowjam Poseidon Ski Helmet Shiny Black with built-in Goggles includes air channels inside the helmet to ensure air reaches your head, helping you keep your cool when you’re riding hard. You can open or close these vents with simple switch on top of your helmet. Goggles slide so you can slide them up when not in use and then slide down when needed.